Last day for food in this wonderful city. 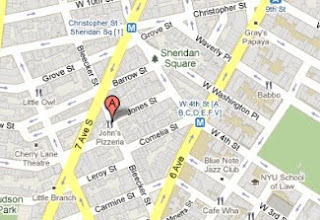 Had lunch at John's Pizzeria on Bleecker Street. The pizzeria does not sell by slice, it only has 14" or 16" pizzas. Four of us split a 16"/8 slice pepperoni and olives pizza and a pitcher of soda. The total without tip was $25. There was a lot of each topping on the pizza, which was great. This pizza was soooo much better than Lombardi's which I tried last week and still have to write about. Thin crust at its best! Click here for the website! (For some reason, none of the links e.g menu, location, etc. work for me). There is also a location near Times Square. Map here.